Anybody use these in .45 . Was wondering if they fed ok and how they worked for pest/snake control . Joe, I've used the .22 Mag shot cartridges and feel like they are good at very close range, 5' or so. Seems like I read that the .45 loads won't cycle the action but I haven't tried them. Joe, Seems like I read that the .45 loads won't cycle the action but I haven't tried them. I heard the same thing somewhere. A 1911 is a recoil based action, hence why going to anything but about 230gr which it was designed for can cause cycling problems. Because Dimitri...Some of us don't particularly like the 230 grain hard ball. Some of us like the 185 grain JHP in our .45 ACP's. In particular...The Hornady 185 grain XTP. You can shoot what you wish but it was meant for 230gr. Still the shotshells would be neat for mouse hunting inside the barn. Dimitri, Your right about the 230 gr. being designed for the 1911. I also recall the 5.56 being designed to run a 55 gr. bullet but the norm today seems to be 70 + grain bullets. Bushy is right about swapping out a different recoil springs. Wolf spring co. makes conventional springs that go to 7 pound and variable springs that go all the way down to 5 pound. I’m willing to bet one of them will make them shot shells run !!! A friend and I got a .40 cal 1911 to run with a 200 gr. bullet running about 500 fps with a 7 or 8 pound spring. The Twist rates have changed on the M16/AR15 to accept and stabilize the heavier rounds better, and not being a recoil system it doesn't matter when it comes to cycling the action. No twist change needed to run different bullets in the 1911. Dimitri...The first 1911's manufactured for the military were, indeed, made for hard ball 230 grain bullets, but the Series 80 came from the Colt factory ramped and polished for anything you can fit into the magazine including wad cutters. Many of the Series 70's were ramped and polished to do the same thing. In fact the Series 70 are in more demand then the Series 80's because they can be really hotrodded. Thought some of you might be interested in seeing these pics. Pic. 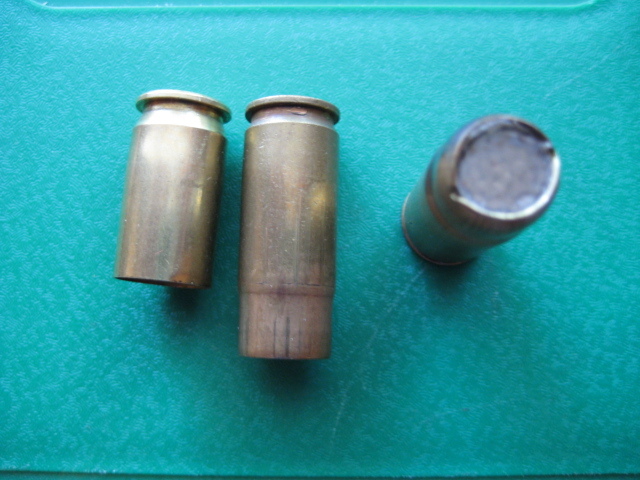 042 shows a standard .45 ACP case, a formed shot shell case, and a loaded shot shell. 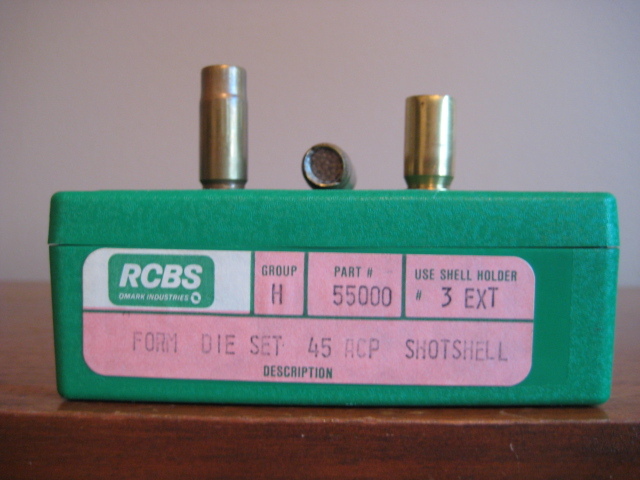 Case was formed from cut down 30-06 case. #12 bird shot is held in place with a thin piece of plastic crimped in. Pic. 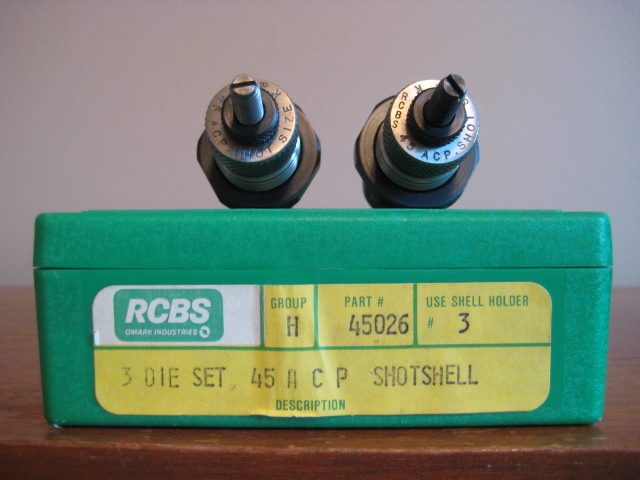 039 shows the RCBS Form die box with cases on top. There's a thought Joe...You might be able to get that .45 to cycle if you can hand load hot enough. Not sure as I have never done this. If I need (and Ihave some on hand) shot (snake shot) shells I usually get .38/357 for my .38 Special...The last snake (Copperhead) I dispatched was with my 9mm X 19 and a hornady XTP.